Anyone else do their own? Mine is curing in the fridge right now; just salt, jam, and whiskey - no nitrites. My younger son does his own bacon. Tell us about the pig. Sir, do you have any suggestions on ingredients for the brine. I plan on cold smoking them afterwards. I will be doing this in four months. For now, the pigs are happy eating a field of rye grass. "Love is the final fight." English, free range but not organic as far as I know; will be getting more particular in the sourcing of the raw product as recipe, method, and my own confidence/experience becomes more refined. Not yet, but somewhere in the future probably. So, this is my first attempt, but I read up on the theory and science and watched various youtube vids about how others have done theirs; hence for now, i'm keeping it simple. From what I understand, salt is the only essential ingredient for dry curing; however, sugar (or other products that have high sugar content such as jam, honey, and molasses) helps temper the salty flavour, reduces the toughening effect of the salt on the meat, and is a catalyst to the curing process by providing food for the 'good' bacteria... sugar is also a preservative. I chose to add whiskey on this occasion as the alcohol is both a preservative and curing agent, and the whiskey flavour will help balance the sweetness of the jam. So, I had a kilo of pig's cheeks curing by the same method in a separate dish; this now being the third day, I put most of them into a casserole to braise for a few hours in a bath of stout. A couple of cheeks that I had kept aside I sliced and fried, surprisingly they had the texture of back bacon and the flavour was a lot like lamb neck fillets, i'm guessing due to the high fat content; delicious with homemade ranch dressing in a sandwich, quite succulent ;P.
So, five days curing and a further five days drying, and... best bacon, lettuce, tomato sandwich i ever tasted, even if i do modestly say so myself - quite the better than expected pleasant surprise! Great looking bacon! I've cured my own a few times with mixed results...perfect once or twice and way, way too salty a couple times. I'm just getting into curing other cuts. 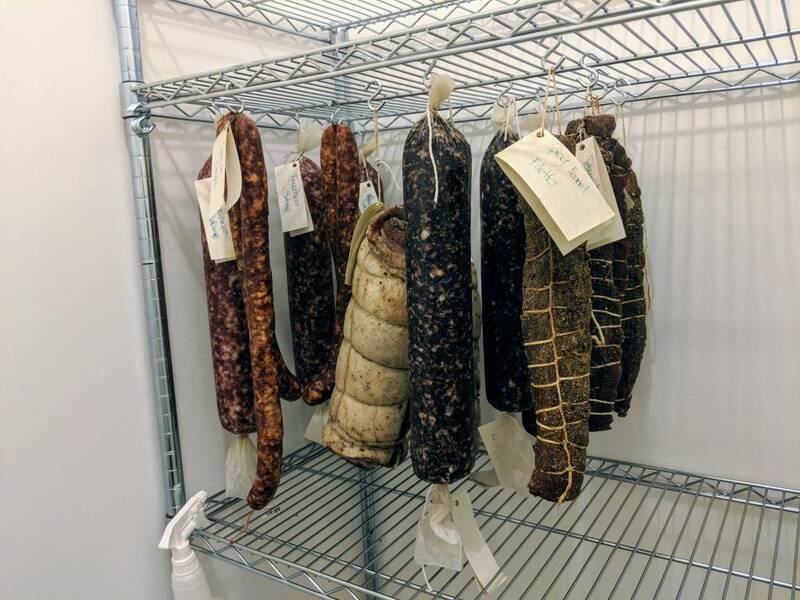 Built a curing chamber with temperature/humidity control and hung a few different salumi. Since this photo was taken I've added a couple coppa, a bresola, a lamb prosciutto, and a couple of ribeye roasts for dry curing. Looking forward to testing some of them next week. Yeah, i found my bacon too salty at first (actually, it was hardly noticable in meals...), surprising as I used the minimum I thought necessary... but it quickly settled down during drying - i have no idea why that was, but it made good eats so... forget about it? I'm thinking the jam i used may have sealed the salt in, or maybe i should make sure the liquid drains away rather than than letting the meat sit in the 'brine'? It's hard to find anything like back bacon in Pennsylvania, and the USA in general. We only have the streaky stuff. I don't know anything about raising or butchering livestock, but I've wondered about back bacon: is it the breed of pig that makes the difference, or is it just the butchering? Anyone have some tips on super easy home-smoking? My last batch of bacon was a bit 'fragrant' and would probably have benefitted from smoking. Do you have a BBQ? My father in law does some mean smoking with just his BBQ. No, I didn't yet find the inkling to buy/make a BBQ - but I would be tempted to.. tell me more - how do I smoke with a BBQ? I'm sure there are multiple methods. The way I've seen it done is to soak ceramic tile and wood chips and then place the tile on either your BBQs propane burner or charcoal coals (depending on type of BBQ) and the chips on the tile. Chips start smoking & Voilà! Confit'd the remainder of the second batch, then pressed and cooled, then sliced and fried à la Gordon Ramsay - and then awarded myself a BF Goodrich star for the most amazing eating bacon ever!